Andhra Pradesh topped the list in the business reforms action plan ranking released by the department of industrial policy and promotion last month. New Delhi: Delhi moved one spot up to replace Gujarat as the most investor-friendly state in the latest National Council of Applied Economic Research (NCAER) State Investment Potential Index (N-SIPI). N-SIPI 2018, which was released by Delhi-based think tank NCAER on Friday, has been constructed on the basis of six pillars that are classified under the following four broad categories—factor-driven (land and labour), efficiency-driven (infrastructure), growth-driven (economic climate, and political stability and governance), and perceptions driven (responses to the surveys). Each of the pillars is, in turn, based on a number of sub-pillars, ranging from four in the case of land to 11 for infrastructure. N-SIPI 2018 also incorporates the results of an extensive survey conducted in May and June 2018, covering 1,049 industrial units across 20 major states and the Union territory of Delhi. The perceptions-based survey helps assess the ground level impact of various reforms. The findings of the survey show that Gujarat has retained the top spot, with Haryana and West Bengal occupying the second and third places, respectively. West Bengal particularly has shown tremendous improvement by moving up 18 places from the 21st to the third spot. Uttarakhand, too, has made significant improvement by moving up 10 places in the perception-based rankings, while Telangana and Andhra Pradesh slipped 17 and 15 places, respectively. The states at the bottom with regard to the perceptions survey are Karnataka, Telangana and Maharashtra. 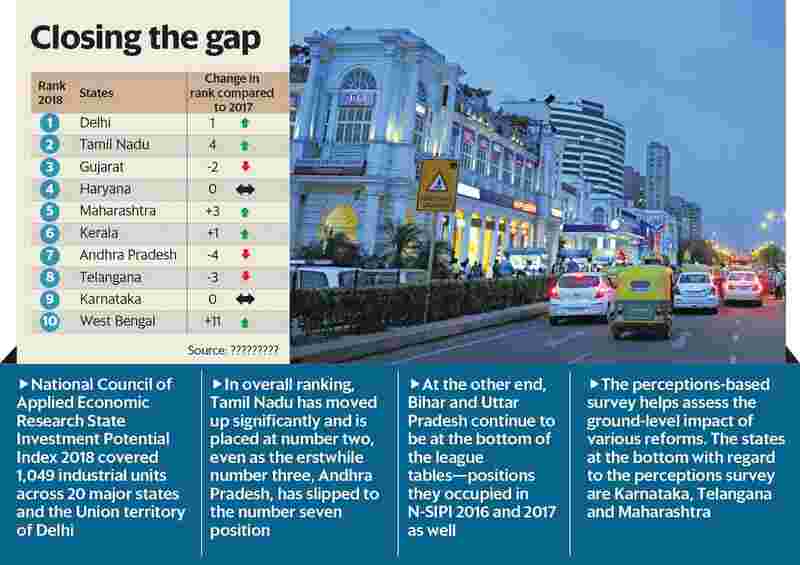 In overall ranking, Tamil Nadu has moved up significantly and is placed at number two, even as the erstwhile number three, Andhra Pradesh, has slipped to the number seven position. At the other end, Bihar and Uttar Pradesh continue to be at the bottom of the league tables—positions they occupied in N-SIPI 2016 and 2017 as well. The survey gives interesting insights. Bihar and Karnataka face serious challenges in the procurement of land, while Telangana, Madhya Pradesh and Tamil Nadu are ranked as the top states for getting land. In terms of labour, Gujarat and Haryana are perceived to be the best states, whereas Jharkhand, Karnataka, Assam and Maharashtra are lagging behind. Chhattisgarh, Punjab, Haryana and Karnataka are doing well in terms of the availability of power supply. As regards the pillar on “economic climate", both Delhi and Gujarat have retained their positions among the top three states, whereas Telangana has moved up four places to the second spot. On the infrastructure pillar, Delhi tops the ranking followed by Punjab and Maharashtra, while Bihar, Jharkhand and Uttar Pradesh have been identified as the states with least infrastructure. When it comes to governance or political stability, Tamil Nadu, Haryana and Punjab occupy the top three spots, while Himachal Pradesh, Bihar and Uttar Pradesh are ranked at the bottom.